Mix together a variety of ingredients to create this emulsified sugar scrub scented with notes of soft pink petals, creamy blonde woods, and vanilla bean chiffon. 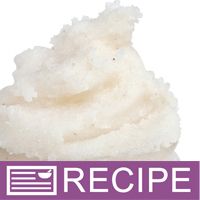 Make an exfoliating scrub from scratch with this sugar scrub making project. Butters and oils are emulsified together to create a scrub that will leave skin smooth and silky. Finish by packaging in clear plastic jars with black ribbed tops and labeling with your own label. You Save $28.40 by purchasing this kit rather than buying the items separately. Sugar, Safflower Oil, Sunflower Oil, Emulsifying Wax, Stearic Acid, Almond Butter, Cranberry Butter, Fragrance, Vitamin E, Phenoxyethanol, Methylparaben, Ethylparaben, Butylparaben, Propylparaben, Isobutylparaben. COMMENTS: I used this kit for my first experience with emulsified sugar scrubs and it was so easy. The end product is very nice. Great scrub and the scent is very nice and light. "Great scrub & Easy to make"
COMMENTS: Great kit, super easy to make, end result is fantastic. I will definitely use this recipe again for future products. "Could I substitute the fragrance with a "marshmallow" type fragrance so it would be like a marshmallow fluff? " Staff Answer Yes, you can substitute another fragrance in this recipe. "Can this kit be made into a foaming whipped scrub? Thank yoU!" Staff Answer You can try adding a lathering agent such as Lathanol LAL Powder, Bubble Up or Bubble Wash Pearlizer to make this a foaming scrub. "Hello, I am excited to try this kit...but had a question. It says it yields 16 jars, but I am only seeing 12 listed in the ingredients. How many do you get? Thanks, Jennifer"
Staff Answer You do get 16 jars with this kit. The way it is listed is (12) 4 oz. Clear Basic Plastic Jars, and (4) 4 oz. Clear Basic Plastic Jars. This is a less expensive way to list the jars rather than 16 jars at $.95 each.